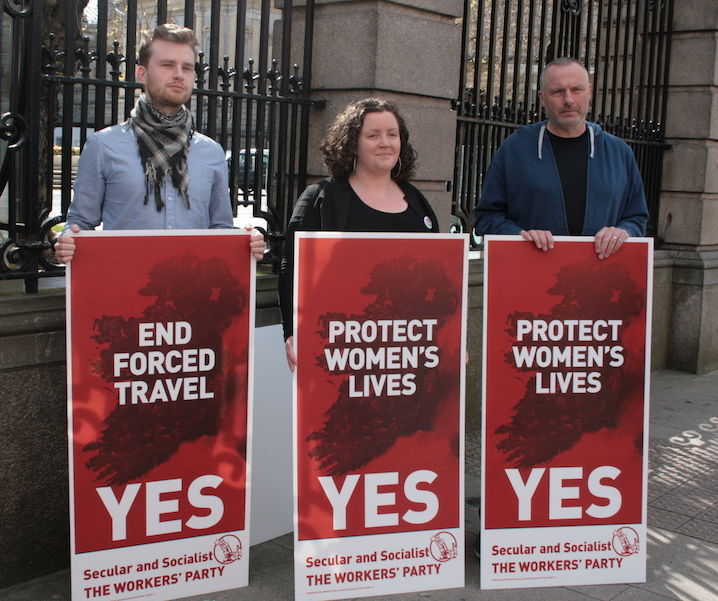 The Workers’ Party this morning (Monday) launched their referendum campaign outside Dáil Éireann. To launch the campaign, the Party displayed their 1983 posters against the 8th amendment, alongside newly-launched ‘Yes’ posters for the 2018 referendum. “The Workers’ Party was the only Dáil party to actively oppose the 8th Amendment in 1983, and we are campaigning for its removal from the constitution in 2018. The Amendment was wrong then, and it’s wrong now. The Workers’ Party said its campaign will focus on three issues – the fact that abortion is already a reality in Ireland, the disproportionate impact of the 8th amendment on working class and low-income women, and the ongoing need to separate church and state in Ireland. “The 8th Amendment impacts on all women, but is felt hardest by working class and low-income women. The minimum cost of travelling to England for a termination is €1000 in the earlier stages of pregnancy. And the financial burden is often increased by loss of income – or even employment – and the need to fund childcare or other family care while a woman is away. “The Workers’ Party – unique in mandating its TDs and members to actively campaign against the 8th amendment in 1983 – argued that it was wrong to inscribe the beliefs of one religion into our constitution.